You have completed training in the IT sector and are currently starting your career, or you already have several years of professional experience? You would like to optimally use your technical understanding and your enthusiasm for new technologies to shape and further extend our system landscape? If working independently in a responsible position with wide-ranging creative leeway is important to you, you should get to know us! We invite you to participate in our success! Can you see a new personal challenge in these responsible tasks? If so, apply for the job as “Computer Scientist / IT Specialist as developer (m/f) Ruby on Rails” with your complete documentation including copies of relevant certificates and stating your salary expectations by clicking the Apply button, or send an email to karriere@huettig-rompf.de. We will send you a reply promptly after receiving your application. After we checked your application we will contact you. 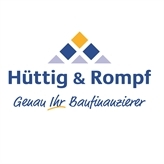 Buy, build, modernise: At Hüttig & Rompf AG everything revolves around a suitable mortgage. We carry out our daily business on the basis of a software we developed in-house, which implements loan calculations for the customers, considering banking conditions, calculates the salesforce commissions and manages personnel master data. With 30 branch offices across Germany, more than 170 consultants and a mediated finance volume of €2.00 billion annually, we are one of the three leading mortgage brokers in Germany. Want to get notified about new jobs at Hüttig & Rompf AG?